New Hampshire provides vocational and trade education at both the secondary and post-secondary levels, allowing students to begin a career-focused education at a time that’s right for them. Comprehensive high schools, career and technical centers, and community colleges throughout the state help prepare students for careers in high-paying, high-demand areas such as New Hampshire’s rapidly growing healthcare technology industries. Read on to find out about vocational and trade education options in New Hampshire, and the careers they can lead to for graduates. 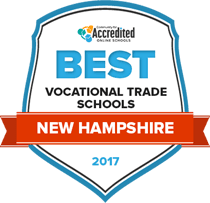 The trade and vocational school options available to those in New Hampshire can be found in the following rankings. The community college, career school or trade institution programs that may be of special interest to students largely focus around the healthcare fields, as these are some of the fastest-growing areas of the state. Our rankings list accredited New Hampshire schools based on tuition, financial aid, student-teacher ratio and other points that matter to students. NHTI Concord’s Community College offers its students almost 90 different programs of study, ranging from professional certificates to vocational associate programs. Vocational study will train career-oriented students in a specific field that they are interested in, allowing them to build connections with their employment community and gain the knowledge they need to be hired. NHTI students are encouraged to socialize with their academic peers, which is why numerous clubs and organizations have been developed throughout the campus. Fraternities and sororities help to build life-long friendships among students, and special interest groups allow anyone to meet with other like-minded individuals. The degrees available at River Valley Community College vary in level and educational style, including associate and certificate programs that can be completed online, with winter or summer classes, or with evening classes. Students can decide whether they would prefer to continue at another university or complete their studies with a vocational program and immediately begin their careers. The benefit of studying in a vocational program at River Valley Community College is that students can be certain that the career they are pursuing is in high demand, and their education will be valued in whatever field they are interested in. Students interested in studying for a vocational program have the option of earning an associate of applied science degree from Lakes Region Community College. Vocational students will be provided with all the educational opportunities for traditional classroom learning, in addition to numerous chances to participate in hands-on educational scenarios. Numerous credit options are available to adult learners, permitting them to cover required credit with transfer credit, experiential learning, or specialized examinations. LRCC also stresses the importance of students maintaining their health by providing multiple health clinics and fitness centers. With over 30 degree programs to help students achieve their goals, Nashua Community College would be an excellent academic option for any student interested in pursuing a vocational degree program. Specially designed to focus a student’s education on applied, field-specific learning, these programs guarantee students the greatest chance of gaining employment straight out of college. Compared to many competing institutions, Nashua Community College offers low tuition rates; still, students who may be struggling with payment always have the option to apply for scholarships and federal financial aid. Students interested in living on campus will be treated to modern and comfortable living and dining facilities. New Hampshire students can get vocational and trade education beginning as early as high school. Not only is career and technical education (CTE) available at some of the state’s traditional high schools, but secondary students may also enroll in vocational programs at New Hampshire’s regional career and technical education centers, where they can earn between three and 12 dual enrollment credits. Seven colleges within the Community College System of New Hampshire, along with the Thompson School of Applied Science at the University of New Hampshire, provide vocational education to New Hampshire’s post-secondary students. Prospective students can use this tool to help them find vocational and trade schools in New Hampshire. Vocational and trade programs in New Hampshire include work experience or a capstone experience as a required component. 94.5 percent of New Hampshire’s secondary vocational and trade students enrolled in the 2013-2014 school year graduated. The technical skills attainment score for New Hampshire’s postsecondary students in 2014 was 93.7 percent, compared with the national average of 79.7 percent. According to the U.S. Department of Education, some 25,000 New Hampshire students were enrolled in vocational programs in 2013-2014, with about 10,000 of those at the secondary level and 15,000 pursuing post-secondary education. Vocational and trade certificates earned in less than one year are relatively uncommon in New Hampshire, perhaps because most post-secondary vocational and trade programs are offered through the state’s community college system, which caters to students seeking associate degrees. However, students interested in programs that take one year or less can find them at career and technical centers in New Hampshire. Below is the breakdown of certificate and degree types earned by students enrolled in vocational and trade schools in New Hampshire, compared to those throughout the U.S. While employment in all of New Hampshire’s major occupational groups is projected to increase in the next several years, healthcare occupations will likely take the lead. Healthcare and social assistance is currently New Hampshire’s largest employing sector, and it’s expected to add the most jobs – about 30 percent – by 2022. Three sectors—healthcare and social assistance; administrative support and waste management services; and professional, scientific and technical services—are projected to supply 50 percent of all New Hampshire jobs by 2022. Healthcare practitioners and technical occupations are expected to see the greatest increase in the number of jobs, with 7,400 new positions representing a 20 percent growth. Due to an aging population and a need for less expensive alternatives to hospitals and nursing homes, home health aides and personal care aides can expect rapid increases in employment in the coming years. Meanwhile, healthcare support occupations are the fastest-growing field, at 22.6 percent. General office and administrative support occupations should also see a significant increase. Occupations in computers and mathematics, as well as those in personal care and service, are also expected to experience at least 20 percent growth by 2022. The table below shows which vocational and trade occupations have the most annual job openings in New Hampshire. Information is split between jobs for those with some college experience and jobs for those with associate degrees. There are two vocational and trade schools in Manchester’s public school system, one for secondary students and one for post-secondary students. Manchester School of Technology is a four-year high school as well as a technical education center for students in the Manchester area. The school offers a range of programs, including automotive technology, culinary arts, game design, health science, carpentry and green technology. Manchester Community College serves southern New Hampshire’s post-secondary vocational and trade students. Students can earn associate degrees and other credentials in career and technical programs designed to prepare them for jobs in several industries, including healthcare, construction, administration and support services, and professional, science and technical services. Vocational and trade students in Manchester can also opt to attend accredited, private, for-profit technical schools like the Laird Institute of Spa Therapy, Salter School of Nursing and Allied Health and Seacoast Career Schools to earn their vocational credentials in specialized fields. A hub for all community colleges in New Hampshire. Provides school and program information, including information on the Running Start program for high school students, as well as workforce training programs. Comprehensive database for job postings in the state of New Hampshire. Allows users to search job openings, post resumes, browse education opportunity and connect with employers. Source of a variety of information regarding New Hampshire’s labor and economy. Includes employment projections, industry overviews and details, unemployment data, economic conditions, career planning guides and occupational prospects. Provides information on the state’s career and technical education programs, including enrollment criteria, performance data, contact information, and community and statewide events and news. An association for the support and promotion of CTE, and a comprehensive resource for secondary students interested in vocational and trade schools in New Hampshire. Includes articles, information on program offerings and student organizations, and other resources. Provides an overview of New Hampshire’s CTE programs and schools, including areas of study, assessments and funding information. Government website containing information about labor laws, employment opportunities, wage and licensure information, and education opportunities in New Hampshire.